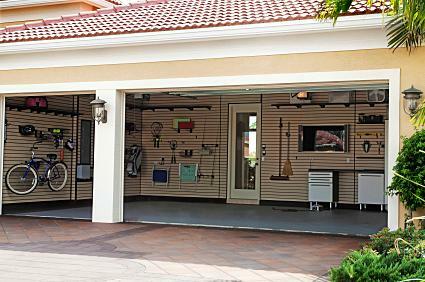 Garages are frequently used as a storage area for belongings that aren't used everyday. The space in your garage is large, is close to your vehicles and yard for easy access and can store oversized items and things you use infrequently. Keep it organized to take advantage of all it has to offer. The main function of the garage is to house your vehicles. After that, your lifestyle and needs will help to determine the way the extra space will be used. Evaluate your lifestyle and storage needs to help you decide how best to organize your garage space efficiently and take full advantage of the garage storage ideas you have in mind. Once you have an idea of how you plan to organize the area, measure the available space in your garage. Having accurate measurements on hand will help you get a realistic sense of what types of organization will fit best. If you're like most homeowners, you keep lots of stuff on the garage floor and ignore the opportunities of all the vertical space near the ceiling. Overhead storage units can get items like sporting equipment, bicycles and pool equipment off the floor, freeing up walkways. You can add overhead bins and shelves that can handle the weight of lumber and ladders, or cabinets that can safely house your Christmas ornaments or camping equipment. Heights are adjustable, and some systems lower down to chest height for easy access at the push of a button. Safe Racks: All sizes and types of overhead storage. Hyloft: Adjustable height ceiling storage in a variety of sizes. Get your bike up off the ground where the floor may ruin your tires during the winter months, and hang it from the ceiling instead. Bicycle trollies are simple lift systems that hook onto the handlebars and seats of your bike. Pull the cord on the other end and lift your bike up off the ground to store it. When you're ready to ride again, just release the cord to safely lower your bike back down. If you have long, thin items like ladders or skis taking up space in your garage, consider using a ceiling rack made just for them. Rather than standard racks that support a platform, these simple and unobtrusive racks are merely brackets that attach to the ceiling. Simply slide your ladder between the brackets, supporting it on either end to get it up off the ground. For heavier or more complex ladders, there are also pulley style systems. Once the bulky items are off the floor and you have some room to get around, take a look at a few ways to store lower profile tools and garden implements on the walls. In addition to bins, there are several other solutions for organizing your items that keep them in full view or in easy reach. 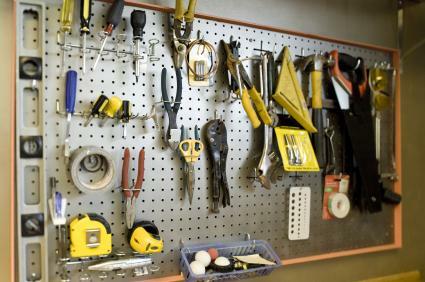 Slats and pegboards are two very simple wall storage solutions for any size garage. Depending on the hooks and accessories you use with them, you can store anything from tools to skis to wheelbarrows without issue. Slat walls are horizontal panels that attach to the wall. Special clips allow you to hang tools and other items without nails, which means they can be moved and rearranged at any time. Pegboards work similarly to slat walls, but instead of panels, they feature one solid piece with multiple holes drilled for "pegs". Move the pegs around in any position to hang what you need. Baskets and bins can also be used with this system to hold smaller items like nails. The Garage Store: Specialty wall storage solutions by category. Shop for sports equipment storage, starting under $20 or for garden equipment storage solutions starting under $15. Most of these items work with slat walls, so they are customizable. Garage cabinets can be expensive, as most are built to fit the size and shape of your garage. However, it is possible to find readymade cabinets for around $250 and up. Premier Garage: Sliding cabinet systems that can keep you completely organized. Sliding systems enable you to access the interior of the cabinets without needing to move cars out of the way. 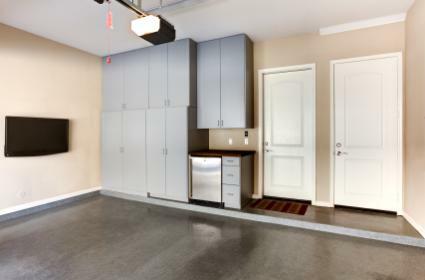 Garage storage systems can help you get the most out of the space. Combine overhead systems and hooks for tight fits, or build-in cabinets and workbenches for larger spaces. Whichever system you choose, you will be sure to have your garage organized safely and efficiently in a short time. Consider adding storage to your garage today and get more use out of your garage space than ever before.